Over 400 Catholic University students attended the Mr. CUA 2018 pageant in the Pryzbyla Great Rooms on Saturday, February 10th. The theme for this year’s pageant was “Bachelor in Paradise”, a spin-off of last year’s widely popular “Bachelor” theme, and it included a talent show, lip-sync competition, and “dad joke” face-off. The Mr. CUA event has been a student favorite since its first run on November 22nd, 1996. Originally created to serve merely as entertainment for the student body, and not to become a competition for actual talent or beauty, the contest over the years has included casual wear, evening wear, and swimwear contests to make crowds in the Rathskeller keep on the edges of their seats. Before the competition, students who came to watch the event enjoyed a tropical fruit buffet and other theme-consistent snacks, while the ten contestants sweet-talked their way through the crowd asking for votes. 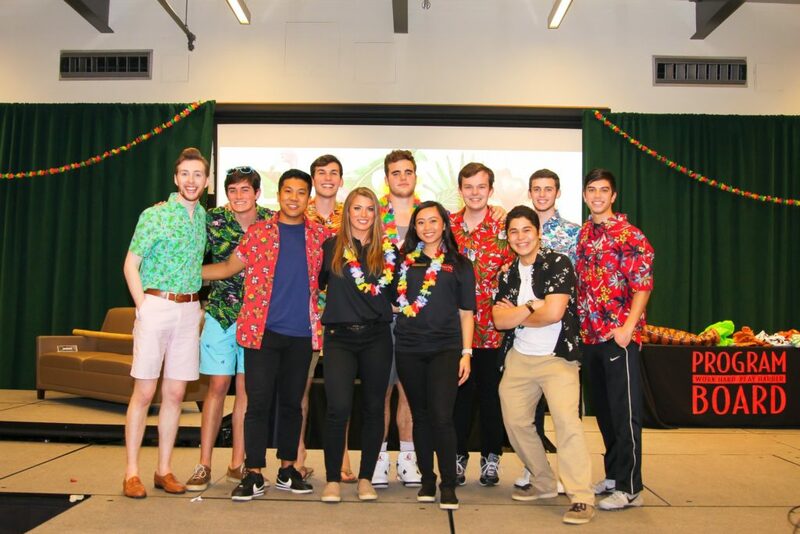 The seats in the Great Room filled up almost immediately after the doors opened at 7 PM, as students jostled for seats close enough to see the floral pattern on contestants’ hawaiian shirts, and the rest of the evening’s event was standing-room only. This year’s “Bachelor in Paradise” pageant was a spinoff of last year’s “Bachelor” theme. Sophomore Julia Ma, a Programming Chair for Program Board, described this year as “less Bachelor, more paradise” vibe which was more casual than last year’s black tie affair. The ten male contestants were introduced with a brief biography by student hosts Kelly Bourbon and Thomas Doyle before heading into the evening’s talent show. The expected musical numbers were carried out in the five singing and instrument-playing acts, including the performance of one original song by one contestant, Samuel Lopez, and two dancing acts which were full of Justin Bieber nostalgia and references to Katy Perry’s Super Bowl XLIX halftime show (major props to you, kid who dressed up as Left Shark for your friend’s talent act). Sean Miller defended his Philadelphia roots in a stand-up comedy routine and David Fisher performed a glorious “synchronized swimming” routine on land with four friends in matching pink swim caps. In a surprising twist of talents, Patrick Vidal made balloon animals for his act, and won the hearts of the crowd when he brought out a bag of pre-made inflated creatures to hand out to audience members. The evening’s three judges were Brandon Carr, Assistant Director of Events and Operations, Christian Sapienza, Dining Services Marketing Director, and, both a fan and contestant favorite, Ms. Willie, a customer service specialist from the Pryzbyla Food Court. Four contestants were eliminated by the judges after the talent round, and the remaining six moved into the lip-sync competition . Four more contestants were left behind as the two final participants, Vidal and Will Clemens, advanced into the “dad joke” portion of the evening, during which each contestant had to pick a “dad joke” out of a bowl and read it to the other trying to make him laugh. In between dad jokes, Christian McCarren and Nick Gangemi wove through the crowd and allowed audience members to ask the contestants questions. Most of the questions had the potential to incite heated debate— like “What is your favorite bathroom on campus?” (Clemens’ answer: the first floor of Father O’Connell Hall, which, upon careful consideration, he admitted was probably for employees only) and “Do you eat mac and cheese with a fork or spoon?” (Vidal’s diplomatic response: “Spork every time”)— but the remaining two contestants navigated through the high pressure with poise and grace. After the final dad-joke was cast, the audience had the opportunity to vote via Program Board’s Twitter to determine who would be crowned the 2018 Mr. CUA and who would be stuck as runner-up. Patrick Vidal won the popular vote and won the coveted title. In addition to the laughs and entertainment that the Mr. CUA pageant brought, the new branch of Program Board, PBGivesBack, launched the first-ever Mr. CUA women’s hygiene product drive in the weeks leading up to the event. The contestant who gathered the most donations was given immunization from the first round of elimination— although runner-up Will Clemens, who rallied together friends who collected a total of 80 boxes, didn’t need it to get 2nd place in the pageant. PBGivesBack got 177 boxes of feminine hygiene products, which totaled 4,989 individual products, for a nearby women’s shelter. Ma commended Program Board members Katie Kolberg and Krishia Anne, who organized the event. “The first week of classes they were doing their treasury board presentation for it; they decided the theme and then all winter break they were working on the plans, so I’m so happy that all the work that they put in was worth it,” Ma said.